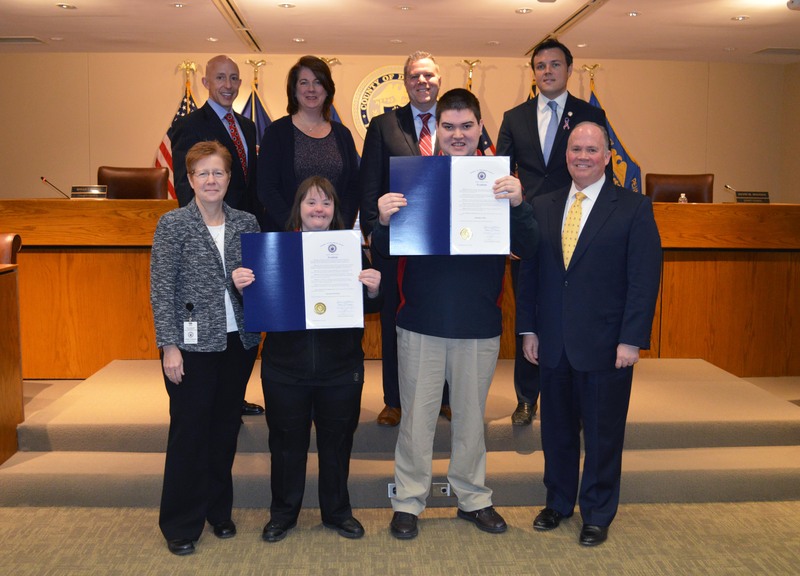 Delaware County Council joined members of the Delaware County Office of Intellectual and Developmental Disabilities and various organizations serving residents with disabilities to declare March as Intellectual Disabilities Awareness Month during the March 20 public council meeting. Intellectual Disabilities Month recognizes the contributions of people with intellectual disabilities who are valued co-workers, family members and friends in the Delaware County community. Since this observance was started by President Ronald Reagan in 1987, much progress has been made. The Delaware County Office of Intellectual and Developmental Disabilities, the Delaware County Employment Forum, and the Delaware County Resource and Advocacy Organization all work collaboratively to support individuals with intellectual disabilities to live as fully included members of their communities. Additionally, some valued partners include the Delaware County Intermediate Unit and our school districts, agencies such as Elwyn, Devereux, Melmark, the LinGroup, Community Interactions, the Office of Vocational Rehabilitation, Community Integrated Services, and creative programs like the New Avenue Foundation and many more. During the meeting Council recognized two individuals, Brendan Cullen and Amanda Rothstein for their contributions to their community noting that Cullen and Rothstein are shining examples of self-advocacy and empower people with intellectual and developmental disabilities through their own self-determination, independence, and success. Top row, from left: Councilman Brian Zidek, Vice Chair Colleen Morrone, Councilman Mike Culp and Councilman Kevin Madden. Bottom row, from left: Deputy Administrator of the Office of Developmental Disabilities Dr. Susan Proulx, Amanda Rothstein, Brendan Cullen and Chairman John McBlain.